In the 2015 UK General Election, the Conservative party pledged to reset the UK’s relations with Europe, holding an in-out referendum on membership of the European Union and repealing the Human Rights Act, to be replaced with a UK Bill of Rights. With the decision now taken to leave the EU, the future of the Human Rights Act and the UK’s relations to the European Convention on Human Rights remains uncertain. 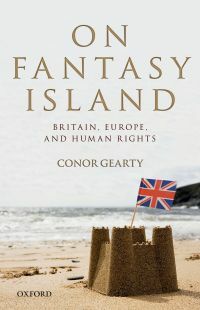 Conor Gearty, one of the country’s leading experts on human rights, here dissects the myths and fantasies that drive English exceptionalism over Europe, and shape the case for repealing the Human Rights Act. He presents a passionate case for keeping the existing legal framework for protecting human rights and our relationship with the European Convention. Analysing the reform agenda from the perspective of British law, history, politics, and culture, he lays bare the misunderstandings of the human rights system that have driven the debate so far. Professor Gearty will be joined in conversation by City academics Professor Ian Loveland and Dr. Mara Malagodi to explore the book’s key themes: the myths that drive the anti-Human Rights Act argument, the operation of the Act, and the future of Britain. There will be the opportunity to purchase Professor Gearty’s new book at a discounted price and have it signed at the end of the event. The book will be sold at £15, CASH ONLY. Please book your place to avoid disappointment. Conor Gearty is Professor of Human Rights Law and Director of the Institute of Public Affairs at LSE, having previously worked at Cambridge University and at King's College London. His books include Can Human Rights Survive? (2006) and Liberty and Security (2013) as well as Freedom under Thatcher (1990) and The Struggle for Civil Liberties (2000) (both with Keith Ewing), and Civil Liberties (2007). He is a Fellow of the British Academy and a Bencher of Middle Temple and has honorary degrees from Sacred Heart University, University College Dublin, Roehampton, and Brunel Universities.